Managing an organization of SchoolNet Namibia’s scale, scope and diversity has been a hugely stimulating experience in the face of numerous obstacles in my way, chief of which *remains* the continued resistance of Namibia’s government to accept the saving ‘cost of ownership’ implications of Free/Libre and Open Source Software, an apparent mistrust of goods and services offered for “Free” (i.e., Open Educational Resources), and an apparent misunderstanding of universal service obligations to the education sector by State-owned telecommunications companies and energy providers! It remains a grim reality that some 806 schools, 50% of Namibia’s schools, try to function without electricity and telecommunications. It was particularly ironic that SchoolNet’s dissolution came a day after Namibia’s Communications Bill, so long in the making, was finally tabled in Parliament (the nth variation, dubbed the “Spy Bill”). I remain deeply disappointed by the undeserved criticism of SchoolNet’s technical support services to schools in Namibia, based on spurious allegations of poor performance by Ministry of Education (MoE) staff and their consorts at xnet and the NETSS advisory committee, which resulted in an instruction to terminate our technical services to schools of Namibia in April 2009. 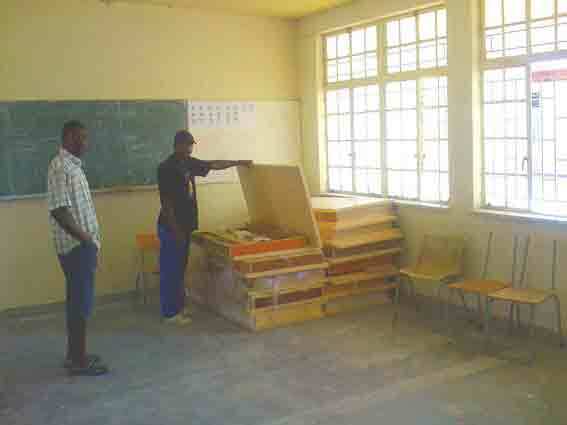 Having chosen to ignore our several appeals for reason, the MoE effectively banned us from carrying out projects of *any nature* at government schools in Namibia. The internet support ‘service’ we had provided of late, at Telecom Namibia’s mercy, was a vestige of what was once an excellent virtual private network (VPN) for schools, built on FLOSS and a very good (working!) ISM-band wifi solution. This VPN was created and generously maintained by our excellent ISP network administrators (Madryn Cosburn, Uwe Thiem (deceased July 2008), Tim Priebe, Laurent Evrard, Steven Delport and others), with the understanding that MoE, Telecom Namibia and other communications sector stakeholders could *eventually* take ownership, through xnet, as planned in the strategic stakeholder agreements signed by SchoolNet and other stakeholders through Tech!Na in September 2006. I remain highly critical of the MoE IT department and xnet’s failure to meet SchoolNet’s reasonable expectations of subsidy for ICT deployment, training, internet connectivity and, most critically, nationwide capacity to provide affordable and sustainable technical service support to schools equipped with ICTs. Especially those schools equipped with Free Software solutions by SchoolNet. These schools are, in effect, going back into the dark ages, as their equipment ages and shall eventually be replaced by a M$FT solution requiring commercial support. Being banned from attending and participating in MoE-led government ICT steering committee meetings by Vitalis Ankama (the permanent secretary of MoE) will obviously not prevent me from being publicly critical of MoE staff incompetence. However, while the boundaries between my persona and that of SchoolNet were often quite blurred, the organisation SchoolNet Namibia and its board of Trustees, staff, voluntary ICT trainers and technicians, per sé, should not have been held accountable for my personal views and opinions. Since SchoolNet was effectively banned from providing any services to government schools in Namibia, we were no longer able to complete the Spanish Agency for International Development Cooperation (AECID) funded solar energy and virtual private network project in Okongo, as originally motivated and planned, in partnership with local and international stakeholders. This ban made it unrealistic for us to continue with this really cool project and we gave the funds (about N$ 1,6 million – euro 150,000) back to AECID last month. That was rather painful. *Agency09*, a fresh start-up NGO comprising mostly former SchoolNet staff and volunteers, was chosen to take ownership of remaining SchoolNet resources. Agency09 is expected, at cost, to continue helping schools on request. You will be pleased to know that *Ebben Hatuikulipi* is the new Chairperson of the board of Agency09, with *Helena Shifindi* as the executive director. They will need all the support they can get, locally and internationally, and I’ll be on hand to help, where needed. Judging from progress by MoE with technology roll-out and support to date (see picture below), I expect that schools will still require external technical service support from Agency09 for considerable time to come. I also hope that Agency09 may yet serve as the like-minded organisation to take direct ownership of the Free Software advocacy and marketing role in Namibia. I have been at the helm of SchoolNet since 1999. I feel strongly that it is healthy to have new leadership from time to time, to introduce new ideas and to bring in a younger, more energetic person to lead Agency09 to new heights. My work has involved a huge amount of management and administration, to the detriment of the advocacy work which I would like to pursue in a wider sphere of influence, internationally. The past ten years of SchoolNet Namibia are rich with well-documented and highly creative lessons which have paved the way for innovative work in Namibia and further afield, even though we now see the unfortunate closure on a great chapter in the history of ICT development in Namibia’s education sector. ‹ We did it! And my ticker held out! This is very sad, anwe are now in year 2011 and nothing has yet been done by MoE.